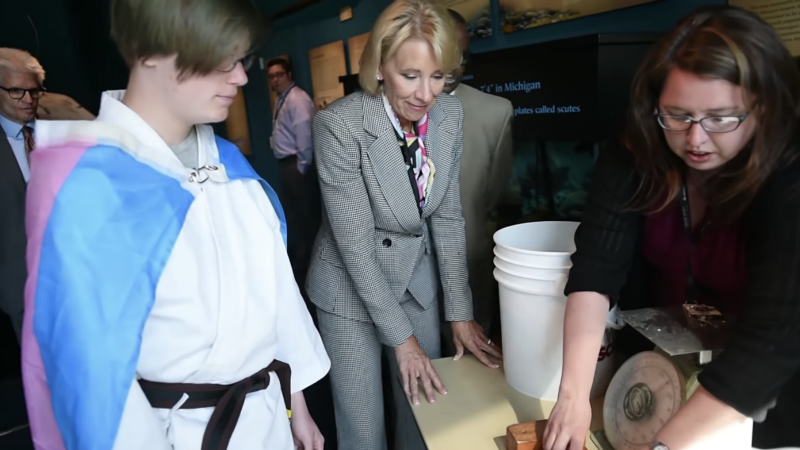 Fourteen-year-old Torin Hodgman decided to make a statement when Education Secretary Betsy DeVos visited their Michigan school: Hodgman wore a floor length transgender pride flag that was impossible to ignore, even for someone as mind-numbingly aloof as DeVos. Michigan Live reported that Hodgman, a genderqueer student at Grand Rapids Public Museum School who prefers they/them pronouns, had one question for DeVos: What is she going to do to make sure students and children questioning their gender identity feel safe at school? Unfortunately, Hodgman didn’t get a chance to ask their question. Still, the flag helped make their point: “Public schools are a place for all children,” Hodgman said on Tuesday. Though Hodgman didn’t get an opportunity to ask DeVos about transgender students, Hodgman is hopeful that over time she’ll push for policies that promote safe learning environments for transgender students. Hodgman feels safe and supported at the museum school. But Hodgman worries about students elsewhere. [...] “Out of all LGBTQ ... and actually all teenagers, transgender and questioning people have a higher rate of suicide and deaths than anybody else,” Hodgman said. In February, the Department of Education announced that they will not investigate bathroom and locker room complaints from trans students, cementing the already-crystal-clear fact that DeVos is no ally to the students she is supposed to be supporting. According to a survey conducted by GLSEN, an organization that works to make schools safe and inclusive for LGBTQ students, 75 percent of trans students feel unsafe at school, and 59 percent of trans students have been denied access to bathrooms consistent with their gender identity.